I suppose it shows the importance of getting the whole picture. Like rather a lot of people, when I first heard that Mark Webber would get a grid drop of ten places for the forthcoming Korean Grand Prix - as a consequence of his getting a 'taxi ride' back to the pits on Fernando Alonso's Ferrari on the slowing down lap of Sunday's Singapore Grand Prix - I thought it was the latest instance of Formula One making a thorough idiot of itself. Senna and Mansell in Silverstone 1991, folklore, and all that. But the headline was deceptive; get beyond it and it all begins to make sense. It's a demonstration that the stewards don't always get it wrong. For one thing, despite the claims to the contrary the grid drop penalty was not just for this. It was a result of the new rule that means an accumulation of three reprimands in a season equals a grid drop (just as in 1997 when many missed that Jacques Villeneuve's disqualification from the Japanese Grand Prix - which oh-so nearly altered the destination of that year's world championship - was a result of accumulated offences and not the single offence committed at Suzuka). And when Webber got his second reprimand of the campaign in Canada earlier this year it was reported widely that this left him with no more leeway (see, for example here). So Webber had no excuse for not making a point of being whiter than white, purer than pure. 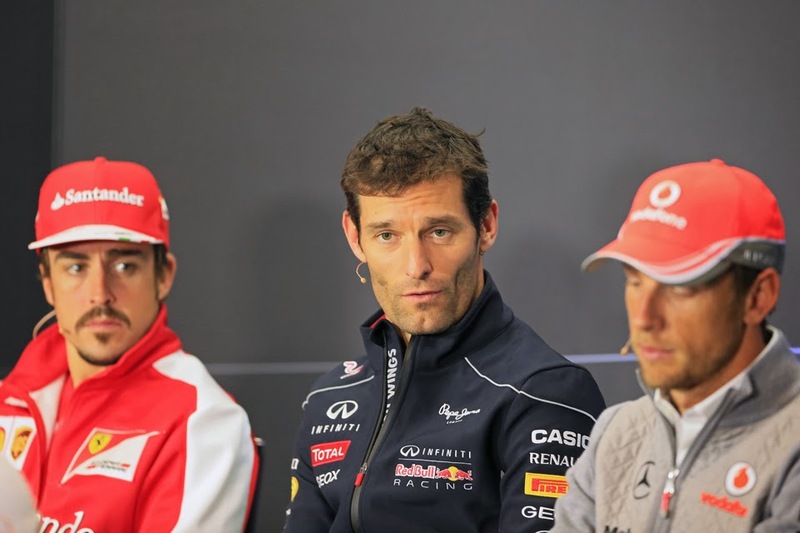 For another, and again despite the claims to the contrary, it was not the 'taxi ride' in itself that got Webber and Alonso reprimanded. It was that Webber entered a 'live' track without permission, and that Alonso stopped to pick Webber up in a dangerous place - i.e. on the racing line at the exit of a blind corner. Autosport has reported that it's been told that had Webber got the permission to enter the track, and had Alonso picked Webber up in a safe place (e.g. off the track), then neither would have faced sanction. And having seen the CCTV footage of the incident in my view the reprimand penalty Webber (and Alonso) got was if anything lenient. Webber spends a long time in the firing line of approaching cars, and where Alonso parked to pick him up at least one car had to jink in avoidance of them (something that Lewis Hamilton noted). And while the F1 car looks impossibly slow on a cooling off lap (given the comparison with racing speed), it'll still be going at more than enough of a clip - in the region of 70kph - to severely injure or even kill someone that it runs over. As someone who marshals I can assure you that entering a 'live' track (which it still is on the slowing down lap) without the marshals' permission is a strict no-no. It'll get you punished at any level of motorsport. And reportedly Webber went beyond this and entered the track even though a marshal explicitly told him not to. All in, I think Webber was bang to rights.